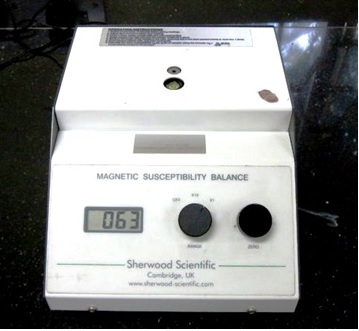 The improved sensitivity, versatility and overall performance makes the Magnetic Susceptibility balance ideally suited for new analytical applications in research laboratory. The room temperature magnetic moment measurement of compounds is achieved by this instrument. This is a non-destructive technique. The room temperature magnetic susceptibility value is helpful in the determination of the oxidation state of paramagnetic ions. Measurements can be made on a wide range of diamagnetic and paramagnetic materials. Small sample quantity (~ 50 mg) is required to give an accurate measurement. The equipment is compact, lightweight, benchtop and hence, easily portable.